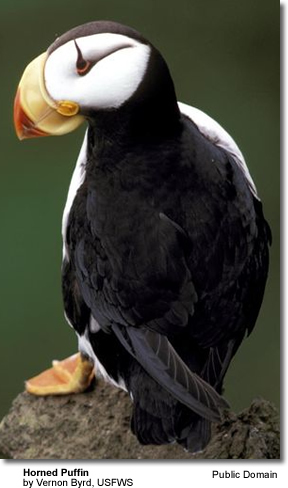 The Horned Puffin (Fratercula corniculata) is a pelagic (open sea) seabird that belongs to the auk family. This puffin breeds on rocky islands off the coasts of Siberia, Alaska and British Columbia, in burrows, in rocky cavities or among rocks. 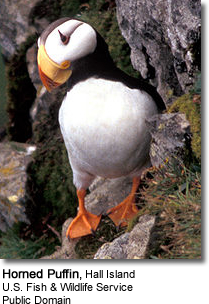 It nests in colonies, often with other auks. It winters far out to sea. Feeding areas are usually located fairly far offshore from the nest. There is usually one chick and both parents feed the young. 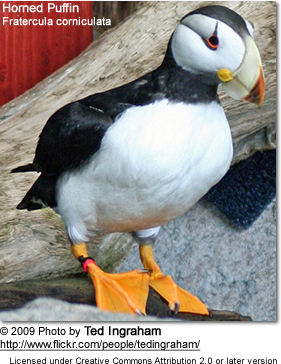 It is similar in appearance to the Atlantic Puffin, except this puffin's bill is yellow at the base and red at the tip. The yellow bill plate grows before the breeding season and is shed later. They have a small fleshy black "horn" above their eyes. They have a white face with a dark line extending from the back of the eye and red feet. 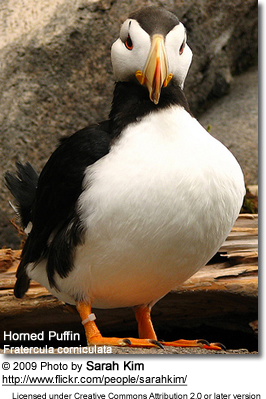 Horned Puffins feed primarily by diving for fish. They will return from hunting with several small fish in their beaks. They also eat squid and crustaceans. 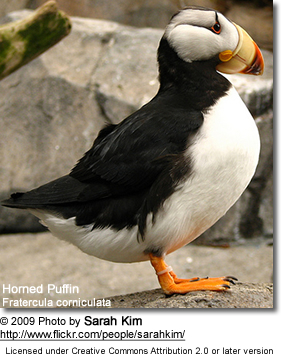 The population of these puffins has declined due to the introduction of rats onto some islands used for nesting.